No need for mayo when you’ve got an avocado! This creamy potato salad combines lemon, garlic, pepper, cilantro, and avocado for a simple and tasty potato salad that’s packed with disease fighting antioxidants. Use colored potatoes for even more nutritious potato salad. Pair it with your favorite veggie burger and roasted vegetables. Preheat the oven to 400 F. Scrub the potatoes until clean. Line a baking sheet with parchment paper and add the diced potatoes. Cook the potatoes for 30 minutes or until desired texture. Allow the potatoes to cool and then add them to a bowl. Remove the skin and the seed from the avocado. 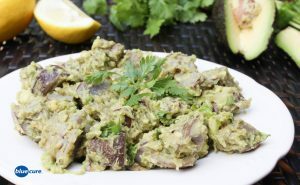 Mash the avocado in a bowl with lemon juice, pepper, and garlic powder. Mix the potatoes with the avocado and fresh cilantro until evenly distributed.